Sure you do remember Quake. And sure you di remember how cool the console faded / slided in from the top? Image this would be available for your Mac OS X Console/Terminal. Well now (actually since ages, but I just forgot to mention 😉 it is. 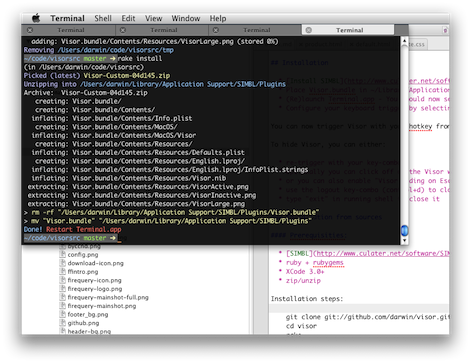 As small SIMBL plugin called Visor Plugin allows to to bring up the Terminal via a hotkey in anytime. I really love it and can’t without it anymore.